When the dishwasher won’t drain, call us. Available to offer fast dishwasher repair in Markham, our team can come to your rescue in a timely fashion. We deal with leaks urgently. And our pros are equipped down to the last detail. Having the proper diagnostic tools and replacement parts with us is a priority at our company. Appliance Repair Markham is fully professional and will do any job with accuracy. Apart from fixing minor or major problems with your dishwasher, we also install and take care of them with regular maintenance service. Call us if you have any trouble with your appliance. 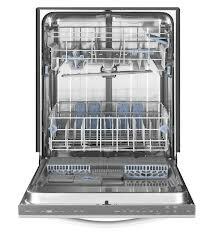 Our dishwasher repair Markham techs are only a call away. Is your appliance overflowing? Does it fail to latch or start up? When you need our help urgently, count on our quick service. At our company, we have created rigid foundations for the technical support of our techs. With modern equipment found in each and every service van, our pros can troubleshoot and diagnose accurately and thus provide efficient dishwasher service in Markham, Ontario. Dishwasher maintenance. By checking and servicing the appliance regularly, you avoid sudden trouble. Did you know that some parts of this appliance might corrode over the years? All components will eventually wear. And when they do, the appliance stops operating well and starts leaking or giving you trouble. With our preventive service, we spare you from this hassle. Dishwasher installation. Our pros will be there to install any brand. We are particularly focused on the unit’s specs and pay attention to every single detail. Your new appliance will be set to run efficiently. Parts replacement. Is the appliance’s door gasket torn? Is one of the hoses broken? Call us to replace any part. When the dishwasher is not washing well or performing as it should, our techs always check the components. Part of our dishwasher repair service is to replace all the burned out, damaged, rusty, and broken parts. Call us to service this useful kitchen appliance! Do you have urgent problems? Rely on our rapid Markham dishwasher repair service. Want new installation? Make an appointment now.